Tonight is certainly a night of changes in Australian politics with a change in the leadership of the Labour Party, and therefore in the role of Prime Minister. Not our finest moment as a country. The changes that follow will be interesting, especially as it is likely that the election will happen sooner. I am not particularly ‘political’ but being a public servant, and working in the nation’s capital, you end up being a bit of an interested bystander to it all! On a very superficial note, our just-ousted Prime Minister had just had a series of photos done where she was playing with her dog and knitting. They were the best ones yet as far as this little crafter was concerned! Oh well – wonder if the new Prime Minister will take up crochet to corner the same market? Probably not. The other change of pace in the house is that I am putting down my personal projects for a short time while I concentrate on making costumes for the eldest chick’s class entry in the annual Wakakirri competition. This is a national competition which, for the primary schools, is a story dance competition. Our school enters with the Year 5 classes each year, and this year is our first as a family. Parents and teachers help out with costumes, props, sets, etc. Sort of unsurprisingly, but still a bit sad, only 5 parents (out of a possible 50+ households) indicated that they could sew…… so the five of us are responsible for making the 80 odd costumes (apparently they change during the performance.) So over the next two weeks I am making tunics, capes and other wonderous things. To keep costs down we are using polycotton – and after months of only sewing with 100% cotton it feels quite strange! I am not the organiser of costumes (I am realistic enough about my restricted availability that I have finally learnt not to put my hand up for everything!) but did have one moment of success in contributing on the weekend. My friend who is organising the costumes said that she had been looking for a wedding dress in the charity shops, but they were still relatively expensive. She didn’t want to ask anyone at school to donate their dress as they are traditionally kept. I agreed, saying that while my marriage might not have lasted, I was still keeping the dress for my girls to have, if they want it. Then, while sitting through the hours of martial arts grading on the weekend I had a brainwave and put a call out on the freecycle network. I had two responses within half an hour! I picked up one dress that had been handed down as a ‘back-up’ through a family member and then stored for a few years, and another that had never been worn, and came with two bridesmaids dresses, also never worn. (I didn’t ask for the full story but was intrigued!!) So we now have plenty of fabric for the costume that is required, plus metres and metres of tulle and satin rosettes to be used for our craft stall later in the year! My girls were quite intrigued with the older dress and how ‘big and foofy it is’. I explained the concept of the ‘meringue dress’ (a la Four Weddings and a Funeral) to them and they were highly amused! The good news is that the other change in this house is that I am finally healthy again! I had my first day back at work today and although I am exhausted, I made it through the day! The virus was nasty but I appear to have beaten it! I knew I was well again when I was able to sew. 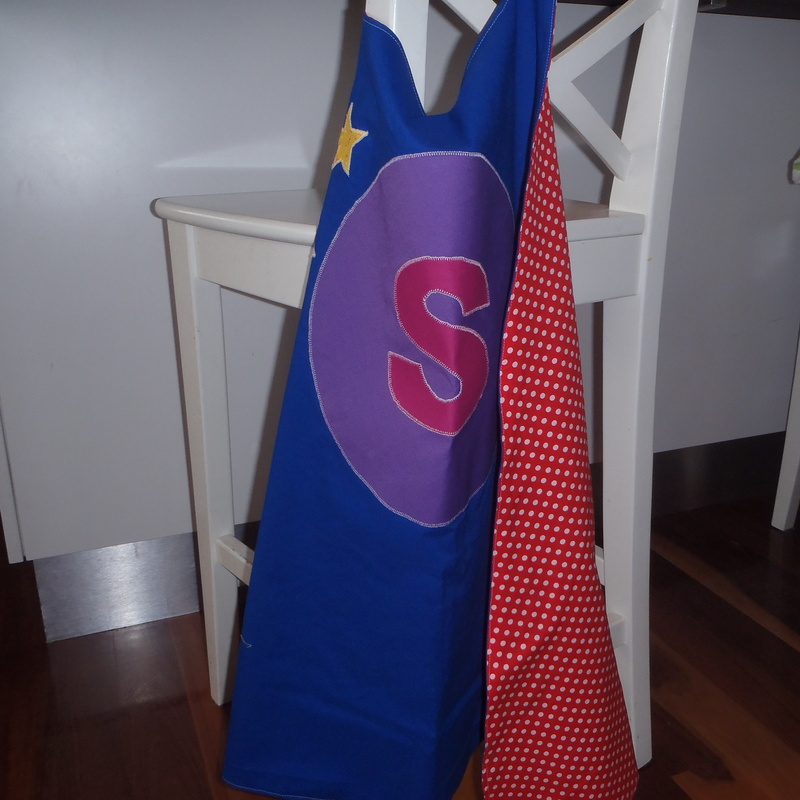 A personalised superhero cape for a little girl in Tasmania was finally made and sent yesterday. I think we should all have one tucked away in our wardrobes, no matter how old we are! Being sick did give me time to think about this blog more though and I finally worked out how to have a link at the top of the page straight to my Etsy shop, and one to my Pinterest boards! A little change, but one that took me ages to work out! Even with all these little changes, the week is going well (unless you are in the Australian Labour Party of course!) I hope that your week is going well too! This entry was posted in Sewing and tagged change, costumes, health, politics, Sewing, superhero cape, wakikirri, winter on June 26, 2013 by a little bird made me.